Matt Douglas, Regional Business Director for CRCS DKI in Oshawa has seen his fair share of frozen pipes. With the frigid February temperatures upon us, we’ve asked for him to share some helpful tips on how to reduce these risks. As the temperatures plummet, pipes within any building can freeze. Here are some tips that you can do to keep them from freezing and some tips on how to thaw already frozen pipes. Firstly, it is important to know where your internal shut-offs are located for outdoor taps. For example, you may have a tap on the outside of your house that you attach a hose to for watering the yard and gardens. It is also very common for a home to have a tap in the garage for a hose to do the same thing in the front yard. These two taps/pipes are the most vulnerable to the cold, and the most likely to freeze and burst. Therefore, make sure these taps are turned off from the individual shut-offs located in the home. Once they are shut-off, drain the remaining water in the pipe (into a bucket) and gently close the outside tap. It will also help to keep the garage door closed as much as possible. The second most susceptible pipes, are the water lines that run to the kitchen, laundry room, and bathrooms along an exterior wall. And, if these pipes are located on the west or north side of the home they are even more vulnerable, as the prevailing winds are usually of a north-westerly flow. Which means those sides of the home take the brunt of the -35C wind chill. To help keep these pipes safe during extreme cold snaps, maintain a minimum of 60F in the home – even when you are gone for the weekend. Also, open any cabinets that contain these pipes, to allow warm air inside the cabinet cavity. If the pipes cannot be exposed to heat, another simple trick is to keep the tap running – just a gentle trickle will keep the pipes from freezing. 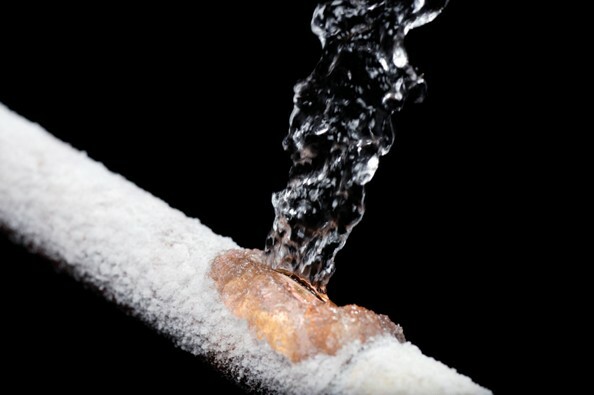 If you suspect a frozen pipe, turn the nearest tap on and gently introduce heat to the pipe. A hair dryer, or a heating blanket are common house-hold items that can thaw the pipe. Do not use a blow-torch or any other open flame device, as that is too hot a heat and extremely dangerous. If you cannot locate the frozen pipe, it is time to call a plumber and have them restore the water flow. To help prevent pipes from freezing in the future, consider relocating pipes to interior walls. And/or add insulation to attics, basements, crawl spaces as that will all help to retain heat in the building.